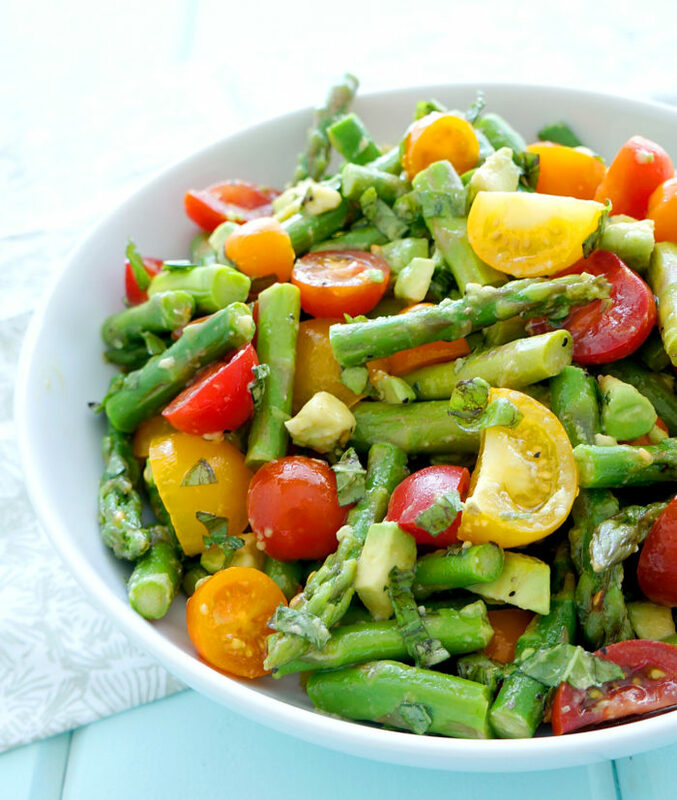 This asparagus and tomato salad is light, refreshing, and bursting with flavour. 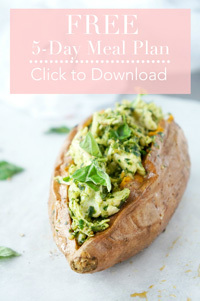 The perfect side dish to serve at your next summer BBQ! Gluten-free & vegetarian. Last week we finally pulled out the barbecue…it’s about time. It’s almost May for crying out loud! I absolutely LOVE barbecue season. Everything just tastes SO much better on the grill. Lately, in our house we’ve been whipping up lots of delicious meals ranging everywhere from these Roasted Garlic & Chicken Feta Burgers (AKA the best burgers EVER!) to these flavourful BBQ Chips Chicken Kabobs. One of my favourite meals to have when the warmer weather hits is grilled up chicken or burgers along with a delicious and refreshing salad. 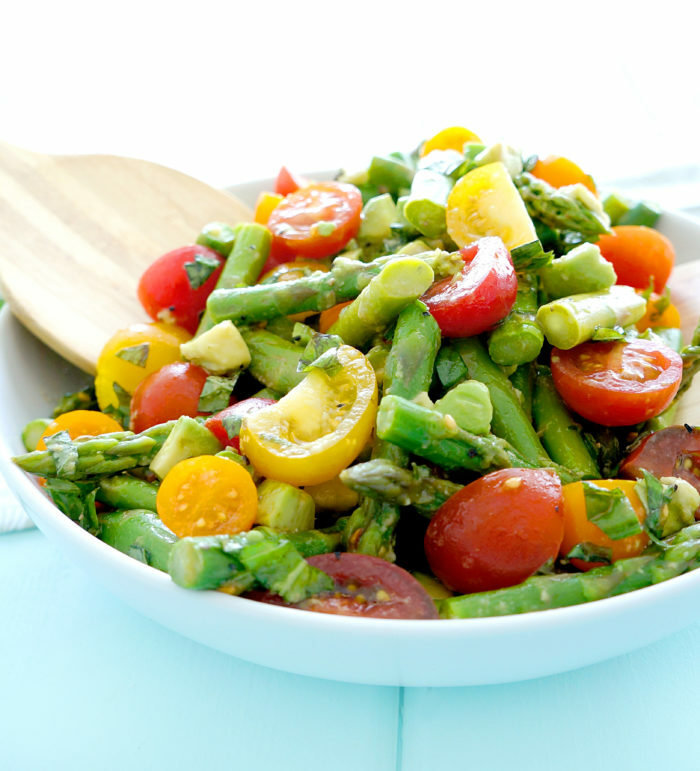 Especially a salad that incorporates seasonal vegetables like asparagus and tomatoes. Can I just stop for a minute to say YUM?? I originally got inspired to whip up this salad because this month at work, we’re featuring foods that are good for digestive health. 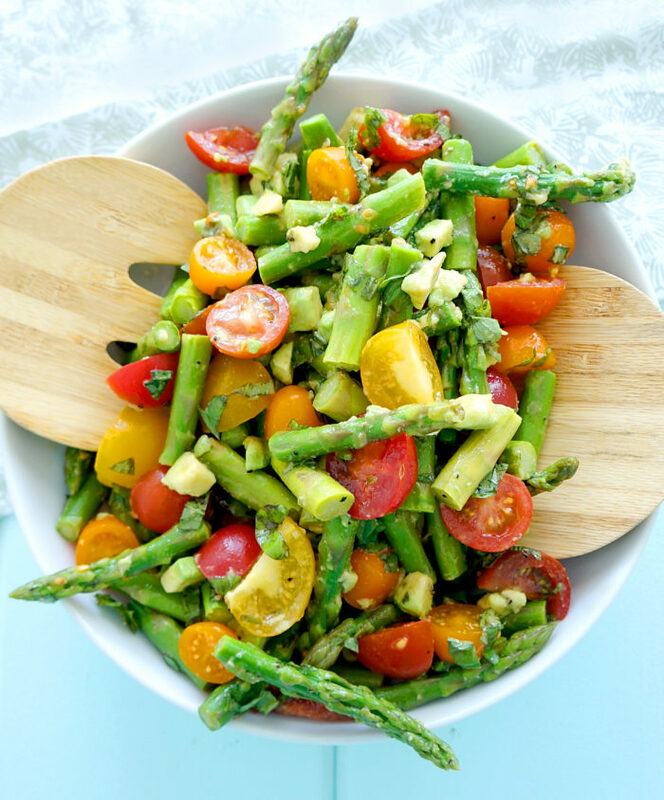 Asparagus and tomatoes just happen to be a source of prebiotics, which basically means that they provide food for the probiotics or healthy bacteria in our digestive tract. Pretty cool, right? When I first planned to serve up this salad, I thought to myself, I’ll throw some asparagus and tomatoes together with a bit of basil and a nice dressing. No. Big. Deal. I never imagined it would be such a hit! 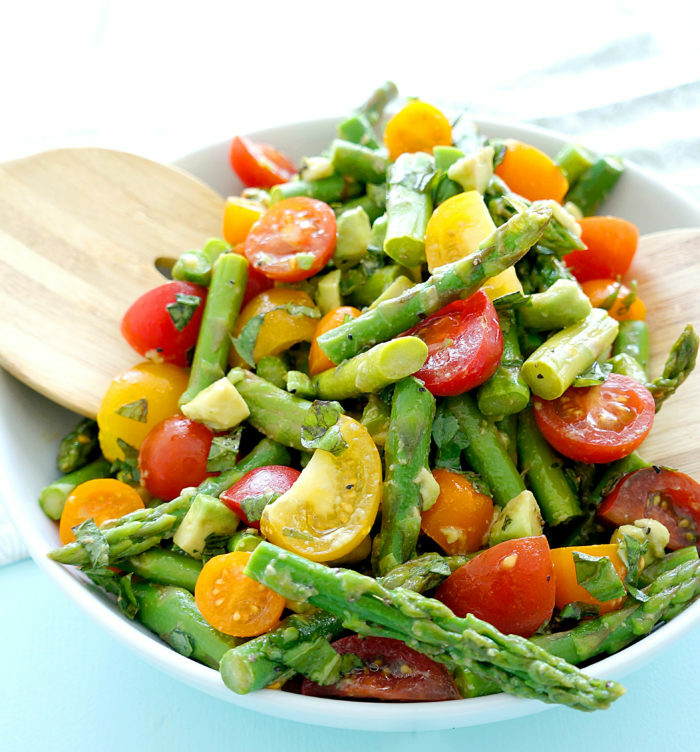 Who would’ve thought that asparagus and tomatoes would taste so delicious together?! The avocado provides a wonderful creaminess along with some healthy fats to the dressing and the feta pumps up the flavour, while adding some protein. Bring a large pot of water to a boil. Add asparagus and boil for 2 minutes. Drain and rinse with cold water. In a large bowl, combine asparagus, tomatoes, avocado, feta cheese and basil. Toss until evenly distributed. In a small bowl, whisk together the olive oil, lemon juice, Dijon mustard and salt and pepper. Pour the dressing over the asparagus mixture and toss to combine. I will be making this salad for tomorrow nights dinner. I’m sure it will taste as good as it looks!! Hope you enjoyed the salad Barb! Delicious salad. I can’t wait to try some of the other recipes on this site. Thank you! Thanks so much Paula! Glad you enjoyed it! I bet you could add some red onions and yellow squash to this. Parboil the squash with the asparagus? Thanks for the idea. Looks delicious. Thanks Sharon — you could definitely add some red onions and yellow squash! I bet it would be delicious and so colourful! Let me know if you have a chance to try it out!